Naaman, the Syrian captain that Elisha healed, thought he could only worship Jehovah on Israelite soil, literally. He loaded up two of his mules with Israelite dirt, so he could still worship Jehovah when he got home (2 Kings 5:17). Many people in Jerusalem during this time thought that God would protect Jerusalem simply because it was where His people and temple were (Jeremiah 7:4).2 In contrast, 2 Nephi 26:33 shows that God values and loves all His children. Isaiah 55:5 clarifies that this invitation is open to everyone, both Jews and Gentiles, “Behold, thou shalt call a nation that thou knowest not, and nations that knew not thee shall run unto thee because of the Lord thy God, and for the Holy One of Israel.”4 This verse from Isaiah shows that when God “inviteth them all to come unto him” the gentiles will “run” to take advantage of the offer. Yet, if God doesn’t care about where someone is from or what ethnicity they are, what does He care about? Simply that people do what He asks.8 Nephi led up to verse 33 by commanding people what they should do and listing off iniquities that people should not commit (2 Nephi 26:24–32). He commands all people to “partake of his salvation” (v. 24), to come unto him (v. 25), to “persuade all people to repentance” (v. 27), to “partake of his goodness” (v. 28), to seek “the welfare of Zion” and not to seek “gain and praise of the world” (v. 29), and for all to “have charity” (v. 30). Nephi then gave a list of further admonitions, which in ways echo the Ten Commandments but are stated in a kind, admonishing mood: “And again, the Lord God hath commanded that men should not murder, that they should not lie; that they should not steal; that they should not take the name of the Lord their God in vain; that they should not envy; that they should not have malice; that they should not contend one with another; that they should not commit whoredoms; and that they should do none of these things” (2 Nephi 26:32). God loves each of His children perfectly and invites all to come unto Him, and in this way all are alike unto Him.10 This is central to who God is. 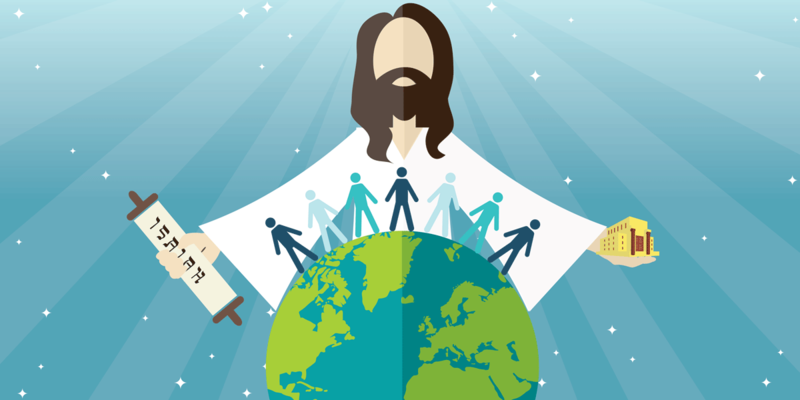 He is not like the false gods of other countries that were only thought to be worried about their own people.11 Even with their differences, God loves everyone on earth and wants them all to keep His commandments and join with Him. This is the main point Nephi was making to his people. He was showing his brothers that Christ “manifesteth himself unto all those who believe in him ... yea, unto every nation, kindred, tongue, and people ... according to their faith” (2 Nephi 26:13). In a world where some people hate others because of how they look, what language they speak, or what country they are from, Nephi’s words remind the modern reader of the love of God.12 Christ “loveth the world, even that he layeth down his own life that he may draw all men unto him. Wherefore, He commandeth none that they shall not partake of His salvation” (2 Nephi 26:24). He does not “cry unto any, saying: Depart from me ... but he saith: Come unto me all ye ends of the earth, buy milk and honey, without money and without price” (v. 25). He has made salvation open and “free for all men” (v. 27) and women. He simply asks his people to have charity and to “persuade all men to repentance” (v. 27). Elder Patrick Kearon said, “We must take a stand against intolerance and advocate respect and understanding across cultures and traditions.”13 This is what Nephi also taught. God loves everyone, regardless of where they are from, what they look like, or what language they speak. If people wish to be like Him, they must do the same. Linda K. Burton, “‘I Was a Stranger’,” Ensign, May 2016, 13–15. President Gordon B. Hinckley, “The Need for Greater Kindness,” Ensign, May 2006, online at lds.org. 1. Mark S. Smith, The Early History of God: Yahweh and Other Deities in Ancient Israel, 2nd ed. (Grand Rapids, MI: William B. Eerdmans, 2002), 60–61. 2. A. R. Pete Diamond, “Jeremiah,” in Eerdmans Commentary on the Bible, ed. James D. G. Dunn and John W. Rogerson (Grand Rapids, MI: Wm. B. Eerdmans, 2003), 562. 3. S. Michael Wilcox, “Nephi’s Message to the ‘Gentiles’,” in Second Nephi, The Doctrinal Structure, ed. Monte S. Nyman and Charles D. Tate Jr., The Book of Mormon Symposium Series, Volume 3 (Provo, UT: Religious Studies Center, Brigham Young University, 1989), 280. 4. Margaret Barker, “Isaiah,” in Eerdmans Commentary, 535. 5. James L. Kugel, How to Read the Bible: A Guide to Scripture, Then and Now (New York, NY: Free Press, 2007), 426. 6. Kugel, How to Read the Bible, 426. 7. Kugel, How to Read the Bible, 426; Jon D. Levenson, Sinai & Zion: An Entry into the Jewish Bible (New York, NY: HarperOne, 1987). 8. Joseph Fielding McConkie and Robert L. Millet, Doctrinal Commentary on the Book of Mormon, 4 vols. (Salt Lake City, UT: Bookcraft, 1987–1992), 1:312. 9. McConkie and Millet, Doctrinal Commentary, 1:308. 10. Doctrinal Mastery: Core Document (Salt Lake City, UT: The Church of Jesus Christ of Latter-day Saints, 2016), online at lds.org. 11. Hugh Nibley, The Prophetic Book of Mormon, The Collected Works Hugh Nibley, Volume 8 (Salt Lake City and Provo, UT: Deseret Book and FARMS, 1989), 529. 12. Brant A. Gardner, Second Witness: Analytical and Contextual Commentary on the Book of Mormon, 6 vols. (Salt Lake City, UT: Greg Kofford Books, 2007), 2:373. 13. Patrick Kearon, “Refuge from the Storm,” Ensign, May 2016, 113.